Disney – Beginning May 1, we are adjusting our guidelines on stroller sizes, which will require them to be no larger than 31″ (79cm) wide and 52″ (132cm) long or smaller. The good news – many of the strollers on the market, including many double jogging strollers, fit within these size guidelines. Also, just a reminder that wagons are not permitted in our parks. Beginning May 1, stroller wagons will also no longer be permitted. These updates are designed to help guest flow and ease congestion, making the parks more enjoyable for everyone. TIP: The smaller your stroller, the easier it is to navigate and maneuver the parks. At Walt Disney World Resort, you can rent a single or double stroller once you arrive, and they can be rented each day. Or, they can choose a Length of Stay Rental, which will save you time and money. While Walt Disney World already offers a double stroller rental, Disneyland Resort will soon offer one too. This means that the popular Keenz wagons will no longer be allowed in Disney Parks. What do you think of this change? Strollers and the wagons are not the issue – the real cause of this change is Disney is cramming more and more people into the parks making them OVER CROWDED. I have been going to Disney since I was a child and now take my kids (more than 40 yrs experience with the parks)…. I have watched the prices to get in and wait times for rides consistently increase year after year. I remember seasonal annual passes costing $179 when I was in college, that same pass is now $487. Wait times used to be 15-30 minutes are now 30 minutes to over 2 hours for some rides. I feel bad for people who saved and come now to find wait times so long that you can only get on 6 rides in a day at Magic Kingdom. I have had days when it took a hour to get from the parking lot to the castle. Disney isn’t “cramming” people. People are willingly purchasing tickets. The number of people who can visit a theme park is set by the local fire marshall. Fastpass+ changed the behaviors of the park with wait times, but those are overcome by using the tools on http://www.characterlocator.com. I rarely wait for anything. Actually the wagons did not seem as intrusive as many of the overly large strollers. But I do not know how the wagons fold for the buses. The larger strollers are a nightmare on buses at times. What I did see last week was folks pulling backpacks on wheels. in the past these were not allowed either. and maybe they came in as backpacks and cast members have just not caught them yet. Can they figure out a way to ban strollers on the busses? Like could you send your stroller ahead and have it meet you at the park? You can’t leave your child in it on the bus anyway. Those rented double wide strollers are ginormous and take up so much room. When my kids were small we rented the stroller at the gate. As a parent with a double stroller I think getting rid of wagons is great. The purpose of a stroller is for a child not to be a luggage rack. On the same token I think a lot of parents are using wagons because kids that are “too old” still want a stroller. The wagons are actually smaller than the double strollers. Parents of two kids get them because they not only are smaller, but they are also cheaper. 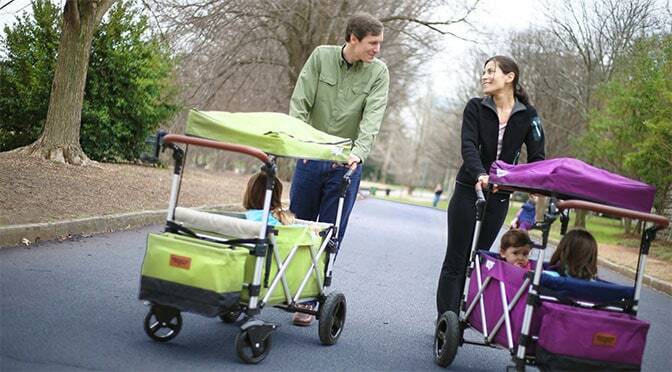 Double jogger strollers run an upwards of $600. The wagon, I got for $350. It doesn’t maneuver as well as the double jogger strollers, but it does move better than the double limousine strollers, which have tiny wheels. Before you judge parents whose kids as too old for strollers, perhaps stop to think that there are children with special needs who use these keenz stroller wagons to address a wide array of sensory, physical, and logistical issues. The Keenz allows my child to enjoy Disney like everyone else and the storage provides space for her neccessary items such as special foods/snacks, textiles, medications, noise cancelling headphones, shields to block excess crowding from view. So yes my child is too large for a regular stroller, even though I purchased a $600 one previously to accommodate her and she no longer fits. However, to say that these should be banned entirely is simply shortsighted. Please consider others before judging. These wagons pretending to be strollers are a relatively new thing. Glad to see Disney recognizes the issue and is putting its proverbial foot down. No one needs a traveling hotel room for their child. These wagons were a cheaper way to bring our two kids for single moms like me. I think it is s great move! We prefer to use two single umbrella type strollers for our grandchildren anyway and we carry backpacks to hold everything else we need. I also think many families carry too many things into the parks that they don’t really need. I have been guilty of that myself. Our favorite stroller is a Kolcraft that we actually bought at Pop Century s few years ago when ours broke. It reclines enough for a sleeping child. We even bought a second one there. A lot of single moms bring their KIDS (plural) and can’t push two strollers or carry all the diapers, milk, warm clothes for the cold evenings, water, jackets, wipes and snacks on their own. We need a little help. This wagon gave moms like me a LITTLE HELP. I’m also thrilled that they’re doing away with those wagons & huge strollers. It’s so unfair to those of us who have been slammed into by them & also had to wait for more than one bus, monorail or shuttle because someone felt entitled to take up all that extra space! I agree it’s an inconvenience for families with young children but what about the rest of us? And I don’t think people should be running into other people w/those wheelchairs either. It just seems like a lot of those people feel like they should always have the right of way no matter what & rarely watch where they’re going. This is great news. I’m disabled and so is my husband but we’ll willing to walk! Very happy about this! Strollers/wagons were getting bigger and bigger. Stroller parking takes up more and more space. Wagons weren’t allowed to begin with yet somehow they stick the word “stroller” on this and it gets through! Glad they’re going away! I am happy about this for myself. I’ve been literally taken down twice by huge strollers! I do feel bad for the families with small children but those strollers and wagons can be huge! Best Disney news I’ve heard in a long time. The size and congestion of strollers has gotten entirely out of control every year bigger, every year more ridiculous. I’m sure Disney will help anyone who has legitimate special needs sort out their options and make sure those children are taken care of. Thrilled about this change. These wagons are huge, and most people simply don’t need to carry that much stuff with them. The number of times my foot was run over or my legs hit by one of these wagons when we visited over spring break was crazy. Very glad to see them go. I know that they are large and we have 4 small grandchildren and don’t use one, but I think that surely if it is ok for people who are not disabled to ride around on the electric carts like maniacs( we have seen a youngish couple sitting on one with an umbrella up so when reversing having no idea what’s behind them and often seen two people on one which is far more dangerous in my view,that to push toddlers around in one of these. I have a special needs child and this wagon makes our trips to Disney easier. So now I have to get a dispensation from the park in order to use it? How is that fair to other special needs families who use these wagons for their kiddos? Contact Disney. Strollers can be tagged as wheelchairs though. Does that mean no more of the Cinderella carriage stroller things? Those are the most ridiculous things ever! Very thankful for this change!! Those stroller wagons were HUGE! I don’t necessarily care about the stroller wagons but most special needs strollers are a bit bigger than that. Those shouldn’t be affected, correct? If it is a medically necessary piece of equipment, they can try to ban it all they want, but your right to use it is protected under the ADA. My son has CP and his adaptive stroller is significantly larger than the regs, but he physically can’t sit upright on his own, so switching to a standard single stroller isn’t a safe option for him. We don’t have plans to visit Disney in the near future, but you best believe that when we do, we will exercise my son’s legal right to use his prescribed mobility device. Not to happy about it just went November 2018 for my daughters first trip and bought the famous Keenz wagon just for that trip and it was a lifesaver! She is a tall and heave 4 year old now and it was nice at the end of the day for her to sleep in and carry our rain gear and souvenirs we bought at the park. Very sad Disney lover over this news. Same, our little one is only 1 but he hates to re restraint in the stroller but the keenz sure made our weekend more enjoyable because he had room. To the people that say the wagon is huge … We parked next to double strollers that were much bigger. We drove with care and had no issues at all. Thank goodness. The sizes were getting out of control and making a crowded park very hard to navigate. This is great news! These massive “Cadillac” strollers are getting out of hand. No one needs to be lugging around something that massive or suped up. I watch these parents trying to stuff these huge strollers onto busses, monorails and trams and they take up a ton of space and make everyone around them squished and trampled on. When I was a kid my parents used an umbrella stroller. It’s essy to maneuver, folds quickly and doesn’t take up much space st all. I think they should do away with the double wide strollers too and switch to the ones with one in front and and one Behind. The ones side by side take up so much room on the tiny and congested walkways.